We make every effort to hide. Here's my hunting partner in full-guilly mode. 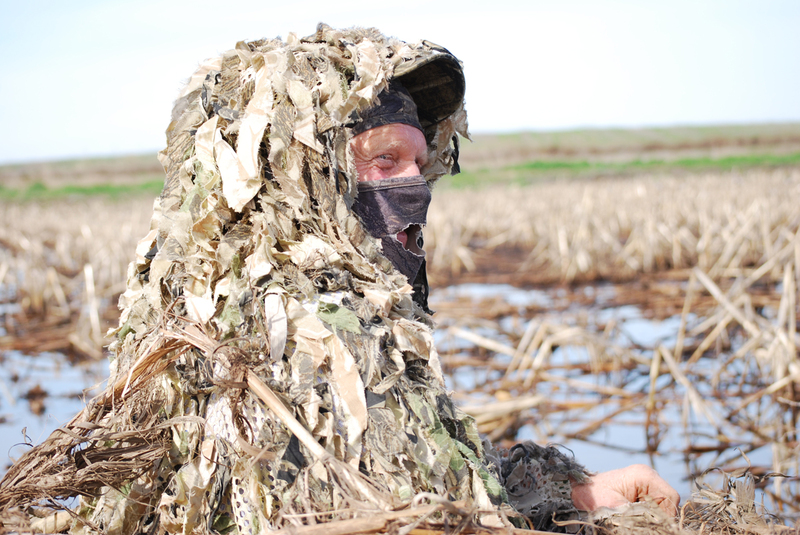 First thoughts about a mid-February specklebelly goose hunt were that it would be quite exciting. As the day arrived, a look at the weather forecast moderated our excitement. Of course we had to give it a try. Our day and a half on Webb Tract was sunny, warm and mostly boring. However, we did bag eleven white-fronts between five of us. 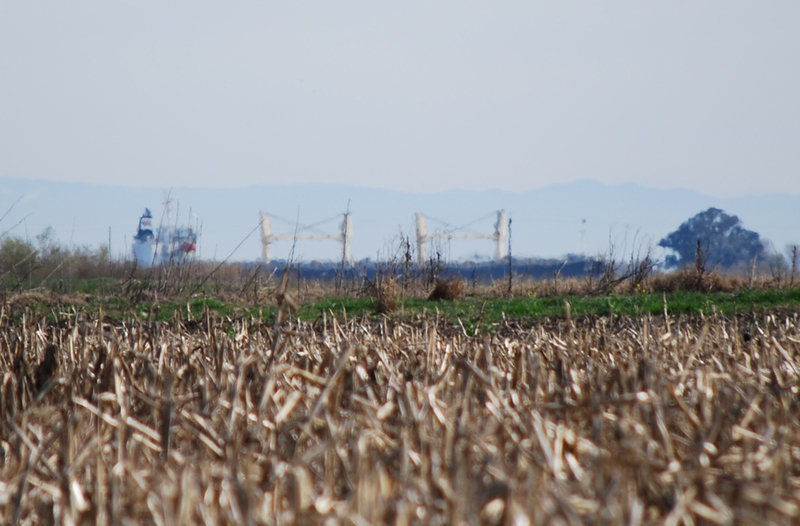 It was mostly a test of long range shooting at passing birds. I killed time by bringing my camera to the blind and taking a few photos. Not very noteworthy, but here are a couple of them. Birds of prey were abundant. 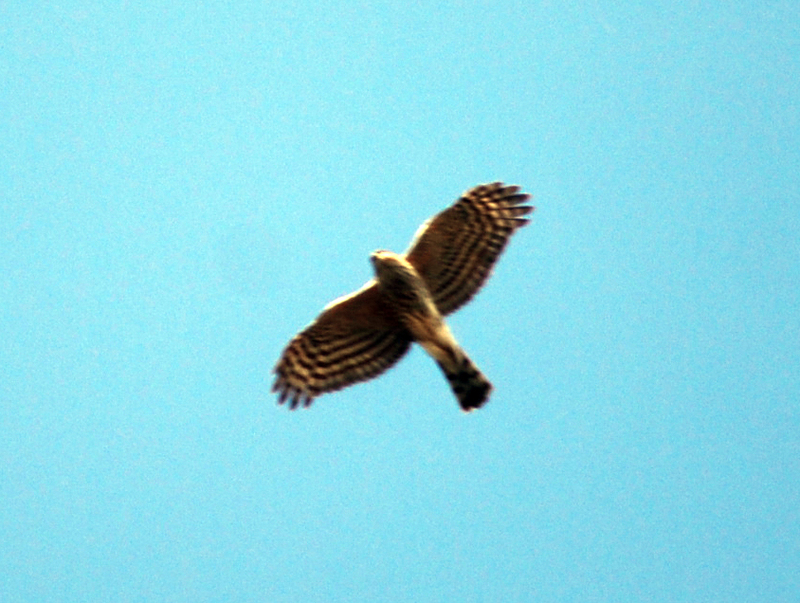 Besides this sharp-shinned hawk, we saw merlins, red-tails, harriers and kites. Sometimes the ships look like they're on land. I’ve seen many mud hens in my life. But yesterday, I observed and photographed one unlike any other I’ve ever seen. Here are a couple photos. 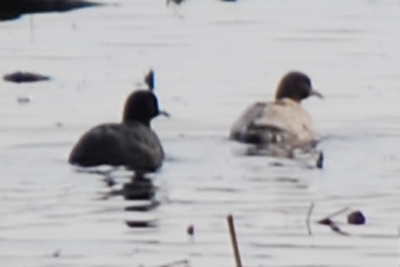 The flock was swimming away and the light wasn't right, but it is clear that the coot at the top is different from all the rest. Today I returned to the same spot and saw the bird again, but unfortunatly, I didn’t have my camera today. Here he is again. To be auctioned at the March 8th, 2012, Livermore-Pleasanton Mule Deer Foundation Annual Banquet. The first tag will be auctioned and the high bidder will have the opportunity to buy the second tag at the same price. To bid by phone contact Randy Morrison at (707) 592 9998, prior to the night of the dinner. Unit 102 runs from Highway 80 at the North end, to Harrison Pass on the South end, (see map) and there are several guides and outfitters who provide service for the unit. For additional information contact Bob Holm @ 925 447 2044. A Landowner Tag allows you to hunt ALL of the legal seasons (with the appropriate weapon) in Unit 102. A Landowner Tag can allow access to hunting areas otherwise restricted by private property. The Ruby Mountains, during the last several years, have provided excellent opportunities on self guided hunts for really good bucks. The deer numbers are the highest in many years and there is an excellent buck to doe ratio. The earlier season hunts can be challanging as the good bucks are in batchelor groups on the top of the mountain. If you’re not a strong hiker an outfitter can take two hunters on a horseback drop camp to the top, with all your own gear, and return, for about $600 each. Also available are the typical fully guided week long hunts. Generally these hunts are not available in the middle and late seasons as the weather is too unpredictable. Of coarse the late rifle season hunts can be less challenging as the bucks pull out of the high country and the rut is active as well. An early winter can produce great hunting in the low desert country, much of that on the private ranch land. Basiccally this hunt can be as easy or difficult as you like. Note: This hunt description was provided by Bob Holm, co-chair of the Livermore-Pleasanton Chapter of MDF. 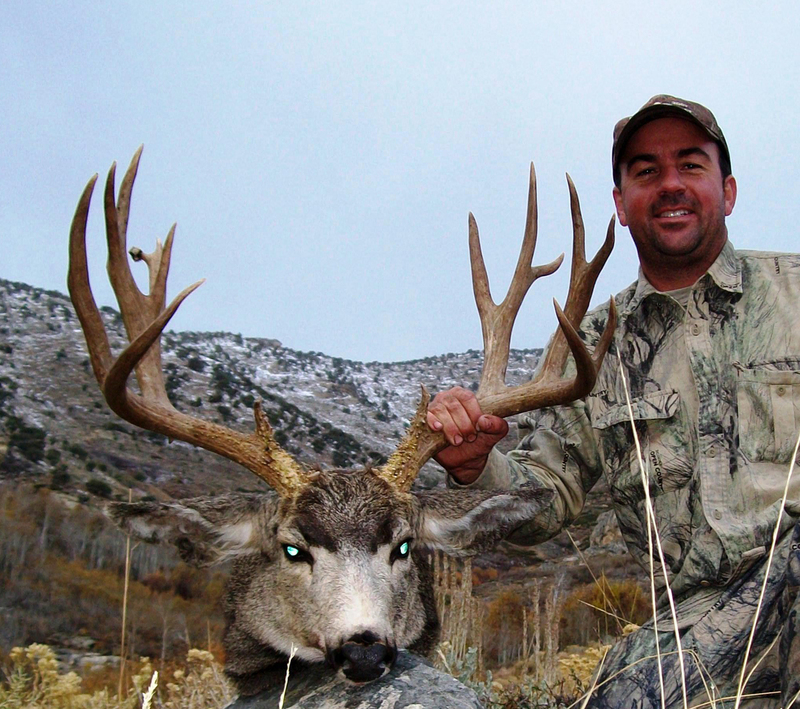 Bob has purchased Nevada landowner tags in the Ruby Mountains and elsewhere. Mountain lions are an essential element of California ecosystems. Unfortunately they are not currently managed in any form. Although the most important cougar prey species, blacktail and mule deer, are managed, a failure to manage the main species that eats deer makes deer management less predictable. 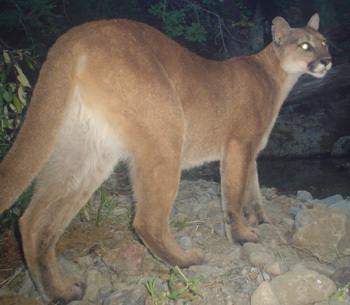 This California lion was photographed with a trail camera near Livermore. A lion like this can take a heavy toll on a local deer population, especially if she has juvenile cubs. Other states have progressive, scientific methods of managing wildlife and consider mountain lions a game animal that is hunted with quotas to make sure numbers of deer, deer hunters and lions is balanced. California is out of touch. 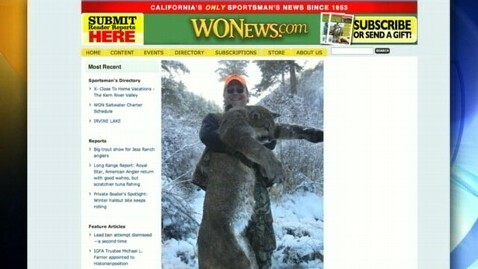 Congratulations to Dan Richards, pictured above with his Idaho mountain lion – which appears to be a huge tom. 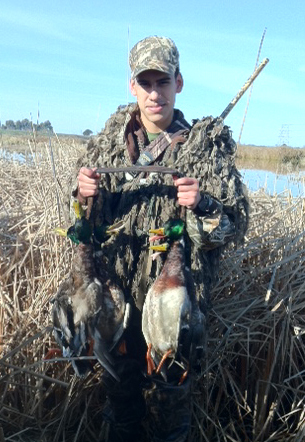 Ivan brought down five green heads that dropped in over our decoys. Took my young friend Ivan out to Mayberry on Sunday morning. Enough mallards worked the decoys for him to knock down five green heads. He didn’t let any escape. Several times he asked if he was hitting the birds in the head. I was impressed when we plucked the birds and four of the five had no pellets in their breasts. They were close and his pattern was tight. Nice shooting Ivan. For the 20th time, Livermore-Pleasanton MDF will raise funds for deer. The event will take place March 8 at the Palm Event Center, 1184 Vineyard Road, Pleasanton. Tickets are $80 single or $125 for couples. The event is limited to the first 250. Tickets can be purchased from Bob Holm, (925)447-2044 or myself. If you have not received a banquet announcement, you can download it here.